A larger entry of 1,392 cattle on offer at Clogher Mart on Saturday, April 13 sold easily to a strong demand in all sections. In the fatstock ring 342 lots presented with beef cows selling to a top of £1,765.40 for 910kg Charolais at £194 per 100kg with another 720kg Charolais selling to £194 to total £1,396.80. Cow heifers sold to £191 for a 660kg Aberdeen Angus £1,260.60 followed by a 570kg Belgian Blue at £189 to total £1,077.30. Fleshy Friesian cows sold to £118 for 760kg. Fat bulls sold to £1,572.90 for a 1,070kg Limousin at £147 per 100kg. Fat steers overage sold to £192 per 100kg. Fat steers underage sold to £204. Fat heifers overage sold to £214. Fat heifers underage sold to £198. Pomeroy producer 910kg Charolais to £194 (£1,765.40), Augher producer 720kg Charolais to £194 (£1,396.80), 620kg Limousin to £187 and 660kg Charolais to £177. Dungannon producer 660kg Aberdeen Angus to £191 (£1,260.60), Armagh producer 570kg Belgian Blue to £189 (£1,077.30), Limavady producer 720kg Limousin to £187. Fivemiletown producer 620kg Limousin to £185. 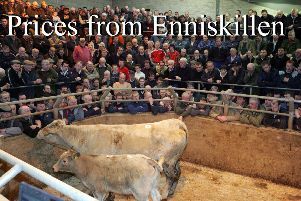 Enniskillen producer 650kg Charolais to £183. Kesh producer 780kg Charolais to £177 (£1,380.60). Other quality lots sold from £150 to £175 per 100kg. Second quality lots sold from £120 to £147 per 100kg. Fleshed Friesian cows sold from £111 to £118 per 100kg. Poorer types sold from £62 to £77 per 100kg. Limavady producer 1,070kg Aberdeen Angus to £147 (£1,572.90), Armagh producer 970kg Charolais to £136 (£1,319.20), Portadown producer 1,080kg Aberdeen Angus to £119 (£1,285.20) and Dromore producer 1,080kg Hereford to £115 (£1,242). 420kg Simmental to £192. 420kg Aberdeen Angus to £176. 910kg Charolais to £174. 660kg Aberdeen Angus to £174. 870kg Charolais to £170. 890kg Belgian Blue to £168. 500kg Friesian to £151 with others selling from £134 per 100kg Fleckvieh steers sold from £132 to £138 per 100kg Saler bred steers sold to £138 per 100kg. 410kg Aberdeen Angus to £204. 550kg Charolais to £198. 650kg Charolais to £179. 540kg Hereford to £157, 520kg Hereford to £157. 540kg Simmental to £157. 550kg Simmental to £157. 610kg Friesian to £155 570kg Friesian to £153. Other Friesians selling from £134 to £146 per 100kg. 590kg Limousin to £214 (£1262.60) 520kg Charolais to £205. 470kg Limousin to £193. 680kg Belgian Blue to £192. 430kg Limousin to £190. 560kg Belgian Blue to £188. 540kg Limousin to £188. 510kg Limousin to £187. 590kg Blonde d’Aquitaine to £177. 680kg Aberdeen Angus to £174. 580kg Aberdeen Angus to £198. 620kg Limousin to £188. 660kg Belgian Blue to £188. 750kg Charolaisto £184. 560kg Belgian Blue to £183. 510kg Limousin to £179. 560kg Hereford to £178. 490kg Aberdeen Angus to £172. 510kg Belgian Blue to £170. 650kg Hereford to £170. 550kg Aberdeen Angus to £169. 630kg Aberdeen Angus to £168. Friesians sold from £126 to £138 per 100kg. A firmer demand in this section with forward stores selling from £175 for a 800kg Charolais at £1,400 to £224 per 100kg for a 620kg Belgian Blue at £1390. Medium weight stores sold from £204 to £245 per 100kg for a 430kg Charolais at £1,055. Leading prices: D G Newell, Portadown 800kg Charolais to £1,400 (£175) and 740kg Charolais to £1,305 (£176), R Watson, Fivemiletown 620kg Belgian Blue to £1,390 (£224), E A Graham, Tynan 800kg Charolais to £1,370 (£171), 680kg Charolais to £1,300 (£191) and 670kg Charolais to £1,275 (£190), Dungannon producer 720kg Hereford to £1,370 (£190), 690kg Aberdeen Angus to £1,300 and 590kg Aberdeen Angus to £1,265 (£214), R Martin, Portadown 700kg Limousin to £1,325 (£189) 680kg Charolais to £1,300 (£191), 730kg Charolais to £1,280 and 590kg Limousin to £1,260 (£213), D Greenaway, Portadown 660kg Charolais to £1,305 (£198), P J O’Neill, Craigavon 600kg Limousin to £1,300 (£213), P and D Prunty Tempo 610kg Belgian Blue to £1,300 (£213), Castlederg producer 620kg Charolais to £1,295 (£209) and 600kg Charolais to £1,270 (£211), F J Coulter, Tempo 650kg Charolais to £1,285 (£198) and H Monaghan Fivemiletown 620kg Charolais to £1,265 (£204). H Monaghan, Fivemiletown 490kg Limousin to £1,150 (£234), P Donnelly, Clogher 490kg Aberdeen Angus to £1,140 (£232), 450kg Saler to £1010, 450kg Aberdeen Angus to £1,000 x 2 440kg Aberdeen Angus to £1,000 (£227), 390kg Saler to £975 (£250) and 370kg Limousins to £935 x 2 (£253), M Brennan Cookstown 480kg Limousin to £1,085 (£226), J Hagan, Clogher 470kg Charolais to £1,045 (£222) and 470kg Limousin to £945. V Hayes, Portadown 490kg Limousin to £1,025. B McWilliams, Seskinore 500kg Simmental to £1,025 and 480kg Limousin to £960. S Kelly, Fintona 490kg Charolais to £995. D J and D Parr Caledon, 500kg Hereford to £985. D Loane, Ballygawley 470kg Limousin to £960. G Mellon, Fintona 420kg Limousin to £955. A good steady demand in this section with strong stores selling from £176 per 100kg to £219 per 100kg for a 560kg Charolais at £1,230. Medium weights sold from £204 per 100kg to £245 per 100kg for a 430kg Charolais at £1055. LEADING PRICES: A Daly, Benburb 650kg Charolais to £1,300 (£200), 640kg Charolais to £1,270 (£198), 620kg Charolais to £1,200 and 590kg Charolais to £1,170. F Flynn, Newtownbutler 660kg Charolais to £1,275 (£193), 660kg Limousin to £1,215 (£184), 620kg Charolais to £1,210. F Donnelly, Coa 600kg Charolais to £1,270 (£211), 630kg Charolais to £1,260 (£200), 600kg Limousin to £1,230 (£205), 560kg Charolais to £1,230 (£219), 630kg Charolais to £1,200 and 560kg Charolais to £1,185. D D and E McElroy, Clogher 620kg Charolais to £1,190 (£192), 560kg Charolais to £1,190 (£212), 560kg Charolais to £1,165 (£204) and 580kg Charolais to £1,160 (£200) and M Nesbitt, Armagh 590kg Charolais to £1,155 (£196). J F McKenna, Clogher 480kg Charolais to £1,165 (£243), D D and E McElroy, Clogher 500kg Charolais to £1,155 (£231), B Doherty, Clogher 490kg Limousin to £1,140 (£232), J Boyland, Armagh 490kg Charolais to £1,120 (£228), 430kg Charolais to £1,055 (£245), 460kg Charolais to £1,040 (£226) and 470kg Charolais to £1,010. C Girvan, Pomeroy 490kg Limousin to £1,110 (£226), N McMullan, Aughnacloy 460kg Limousin to £1,095 (£238), 440kg Charolais to £1,020 (£232), 480kg Limousin to £985 and 480kg Limousin to £980. Clogher producer 480kg Limousin to £1,095 (3228), W J Shepard, Glenavy 470kg Limousin to £1,055 (£224), D G and R McFarland, 500kg Limousin to £1,050 (£210) and 370kg Limousin to £840 (£227), B and J Monaghan, Bellanaleck 500kg Charolais to £1,025 (£205), D Williamson, Portadown 460kg Limousin to £1,010. A Daly, Benburb 490kg Limousin to £1,000. K Maguire, Leggs P O 460kg to £990. M/S S and E Benson, Dungannon 390kg Charolais to £885 and 360kg Limousin to £765. A very keen demand in this section with steers and bulls selling to £1,130 for a 500kg Charolais (£226), C Fee, Tempo £1,110 for 530kg Charolais (£209), 450kg Charolais to £1,005 (£223), 480kg Charolais to £980 and 470kg Charolais to £965. L J Gray, Newtownbutler 550kg Charolais to £1,100 (£200), 410kg Charolais to £1,035 (£252), 400kg Charolais to £1,030 (£257.50), 430kg Charolais to £1,020 (£237), 380kg Charolais to £980 (£258) and 410kg Charolais to £970 (£236), D and D Robinson, Irvinestown 440kg Limousin to £1,035 (£235), N McDonagh, Fivemiletown 420kg Charolais to £1,020 (£243) and 380kg Limousin to £995 (£262), G Moane, Cooneen 400kg Charolais to £1,015 (£254) and 400kg Charolais to £970 (£242), J J McGirr, Augher 400kg Limousin to £1,005 (£251), M Donnelly, Seskinore 420kg Limousin to £965. A W J Shaw, Benburb 360kg Limousin to £955 (£265). D Liggett, Clogher 530kg Charolais to £1,010 (£190) and 500kg Limousin to £945. J McDonagh, Brookeborough 360kg Charolais to £985 (£273), P McElroy, Clogher 400kg Charolais to £975 (£244), P M Cullen, Coalisland 500kg Charolais to £940 and 400kg Charolais to £820. P McCrystal, Sixmilecross 420kg Limousin to £935, 400kg Charolais to £820 and 400kg Limousin to £810. B Collins, Brookeborough 470kg Limousin to £920. N McDonagh, Fivemiletown 340kg Limousin to £890 (£262), S W Campbell, Fivemiletown 470kg Limousin to £880, Kesh producer 350kg Simmental to £870 (£248) and 370kg Simmental to £825 (£223), J Donaghy, Clogher 470kg Charolais to £870. J McElroy, Pomeroy 380kg Blonde d’Aquitaine to £860 (£226) and 350kg Blonde d’Aquitaine to £810 (£231), R Smyton, Fivemiletown 390kg Charolais to £840, 400kg Charolais to £830 and 420kg Blonde d’Aquitaine to £830. A brisk demand for quality lots in this section with a Brookeborough producer selling calved heifers to £1,840 and £1,670. Dungannon producer £1,770 and £1,670 for calved heifers. Macken producer £1,640 for calved heifer. Dungannon producer £1,450 for calved heifer. Others sold from £950 to £1100. Dungannon producer £1,400 for pedigree non registered Charolais (born 04/01/2018). Special entry Saturday, April 20 two pedigree registered Limousin bulls. Another good turnout this week sold to a strong demand especially for quality lots with a Belleek producer selling a heifer with bull calf to £2,510 and a 2010 cow with bull calf to £1,705. A Newtownbutler producer sold a heifer with bull calf to £1,875. Fivemiletown producer £1,815 for 2010 cow and bull calf and 2007 cow with bull calf to £1,455. Fintona producer heifers with bull calves to £1,790 x 2 and £1,560, heifer with heifer calf to £1,600. Ballygawley producer £1,445 for heifer with bull calf and £1,400 for 2013 cow and bull calf. Armagh producer £1,400 for heifer with heifer calf. Irvinestown producer £1,360 for 2011 cow with bull calf. Ballinderry producer £1,330 for 2010 cow with heifer calf and £1,230 for 2008 cow with bull calf. Incalf cows and heifers sold to £1,215, £1,200, £1,150, £1,070, £1,060 and £1,000. Special entry Saturday, April 20, 10 Saler cows and 1 Aberdeen Angus cow all incalf to a pedigree Limousin. Bull due end May onwards also a selection of suckler cows some with calves at foot others incalf for a Fermanagh producer. A large entry sold easily to a very keen demand with bull calves (under 2 months) selling to £445 for a Charolais to William Wilson, Dungannon. D Foy, Fivemiletown £430 for Aberdeen Angus. R Dane, Lisbellaw £405 for Aberdeen Angus and £325 for Friesian. Fermanagh producer £370 for Limousin, T Hughes, Carrickmore £360 for Charolais, P McKenna, Augher £345 twice for Aberdeen Angus. D I Hoey, Maguiresbridge £335 for Limousin, M Breen, Tempo £335 for Belgian Blue and R Hassard, Enniskillen £300 for Aberdeen Angus. G and J McKenna, Omagh £420 for Charolais and £290 for Limousin, William Wilson, Dungannon £390 for Limousin and £340 for Charolais, Lisbellaw producer £335, £330 and £325 for Limousins, Clogher producer £325 and £310 for Charolais. Dungannon producer £305, £300 and £290 for Limousins and R Moore, Fermanagh £290 for Belgian Blue. K M Maguire, Leggs P O £700 for Charolais, Donemana producer £645 for Charolais Fintona producer £600 and £500 for Aberdeen Angus and £505 for Hereford. G J McKenna, Omagh £565 for Charolais, S L Black, Lisbellaw £565 for Belgian Blue, K Kelly, Trillick £550, £530 and £515 for Aberdeen Angus. J Donnelly, Trillick £505 for Aberdeen Angus. G Black, Tamlaght £500 x 4 £ 495 x 3 and £490 x 2 for Aberdeen Angus. Lisbellaw producer £675 for Blonde d’Aquitaine and £605 for Limousin, J Keys, Clogher £505 for Limousin, S L Black, Lisbellaw £480 for Belgian Blue, O Coote, Ballygawley £480 and £420 for Shorthorns. K Kelly, Trillick £455 x 2 for Aberdeen Angus. Mountview Cattle, Dungannon £440 for Limousin, Fintona producer £440 for Hereford and G and J McKenna, Omagh 420 for Charolais.